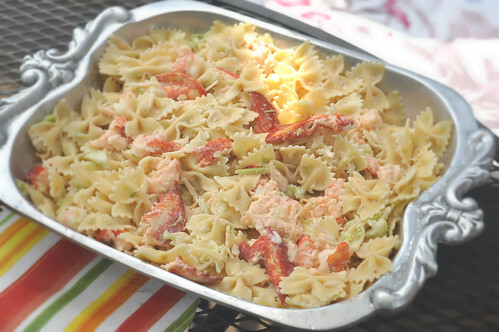 The official name of this dish is “Lobster Tornado salad,” it’s a riff on a family tuna salad recipe. The original tornado salad was so named because every time my aunt made this for dinner when she lived in Ohio they’d end up eating it in the basement while waiting out a tornado warning. The salad is simple: macaroni, mayo, finely chopped celery and a little bit of onion. Salt and pepper to taste and lunch is ready. This tornado salad was gussied up for our visit with lots and lots of lobster. We missed the annual family reunion/lobster jamboree in July because it was too hard to travel with a newborn. My aunt froze our share of the lobsters and voila! While I'll never say no to lobster, plain old tornado salad is just fine by me. The classic version has tuna and when I make it at home I use elbows. It’s probably one of my top five easy meals. Perfect for these real last days of summer when you’d rather be soaking up the warm weather than slaving over a hot stove.